Anyway back to the facts! He desperately wanted to join the local canoe club, as he found paddling so fun. 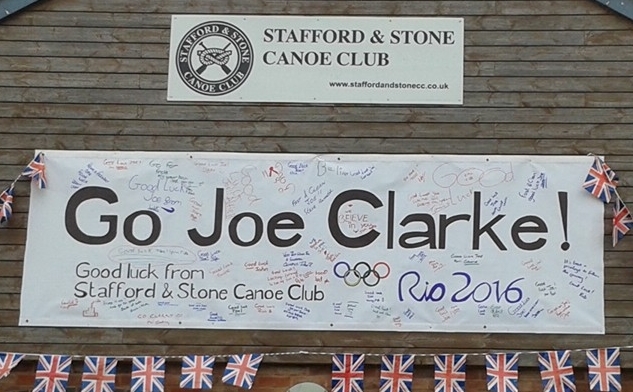 But the only problem was his local canoe club said… ‘no, you are too young’, so he waited a couple of years. He then applied for the school canoe club but as there was only 8 places left he had to write a letter to say why he should have a place. Luckily, he got in and started training; he competed in his first slalom at the age of 11. (That is after me, by the way: I started kayaking at 6 and I started slalom at 8.) Once he was old enough to be in Stone Canoe Club he started training on faster and bigger water. probably the best thing he had ever done for England Olympics. Winning gold medal he can now relax. He keeps training for 3 years to come. I can now safely say he is my ultimate hero!